Robert grew up on a hundred-head dairy farm in southern Missouri. 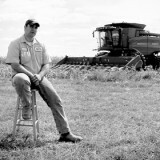 Here is the story of how his choices in life—and God’s intervention—brought him to Heartland. I was born and raised in a small town in Southern Missouri. I had good parents and had a good upbringing. Shortly after high school I started to mess around with drugs, and not long after I became addicted to methamphetamine. I had it under control for about four years. In my mind snorting it or smoking it was not as bad. Then in 2004 I started injecting meth and it turned my world upside down. All I wanted to do was stay high. I had lost my job, turned my back on my parents because I was too ashamed to ask for help. Halloween night of 2005 the police raided my house and I was charged with manufacturing and possession of meth. My mom and dad bailed me out of jail and hired a lawyer who got me out of my charges. From that moment on I thought that my parents were my free card to get out of jail. I stayed low for a while, but my addiction stayed the same. In November the police arrested me again with the same charges as before. I bonded out and went to a 21 day rehab. I completed the rehab and thought that I was healed and ready to help the whole world. After being out for three days I was getting high again. Three months later I was arrested once more. You would have thought that I would have learned by now. I had burnt all my bridges with my family and my parents were not going to help me out this time. I spent a few weeks in jail. The prosecutor and a law officer came to me and told me that they did not want to send me to prison and they wanted to get me help. They both told me that I needed a long term treatment program. While I was in jail I had heard about Heartland from another guy who was there. I told him that I would give it a try. I filled out the application and was accepted. I got here in March of 2009. When I first came to Heartland my plans were to just complete the 18 month program, because I thought then the police would leave me alone and I could go back to what I was doing. I didn’t want to change, but Somebody else had a different plan. Three months into the program I gave my life to the Lord and He delivered me from all the drugs, alcohol, and tobacco. God set me free! It was the best feeling I had ever experienced. While I was in the program my parents cared for my son. Fifteen months into the program God blessed me with my son being able to move here. I graduated the program in September of 2010, and then in 2011 God gave me another blessing. It was the wonderful woman He had planned for me to marry. We were married September 2, 2011. What a blessing! Now that I look back I can see God’s plan all throughout my life. All the things I went through I had to go through or I would have never gotten the chance to give my life to the Lord. I want all the glory to be God’s for the things He has done in my life. Robert Hambelton Testimony from hlandtv on Vimeo.